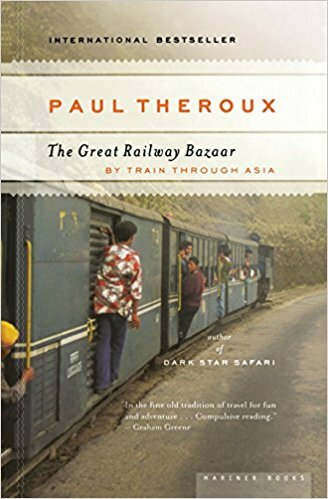 Although it was not his first published book, The Great Railway Bazaar was Paul Theroux’s first to be profitable. Written in 1975, it describes the journey he took from England through Europe and southern Asia to Japan and then back through Russia almost all the time on railroads. On the journey, he travels on some fabled railways, such as the Orient Express when it still went to Istanbul and the Trans-Siberian Express. This isn’t a traditional travel book. For the most part, Theroux isn’t interested in describing tourist destinations. There is some description, but Theroux is mostly interested in the people he meets on the train and the glimpses of life beyond. The book is interesting but especially for me in describing countries as they no longer are but were during my lifetime. He describes a Middle East not torn by war, as it has been since the 1980’s, an Iran ruled by the Shah, a Vietnam abandoned by Americans but still at war. He dismisses Afghanistan as a country to be avoided in future but not because of war. His descriptions of conditions he finds are graphic, and his conversations on the train are sometimes funny. He is a keen observer of human behavior. This book just zipped by for me, I was so interested. I was surprised to find that at that time, the Orient Express was one of the least luxurious trains he takes. It is more luxurious now, but sadly it no longer goes to Istanbul. The Folio Society edition I have is full of beautiful photos of people traveling on trains. Unfortunately, none of them were taken by Theroux on his journey. I was so impressed with John McPhee’s Annals of the Former World that when I found Coming into the Country during a trip to Powell’s, I snapped it up. 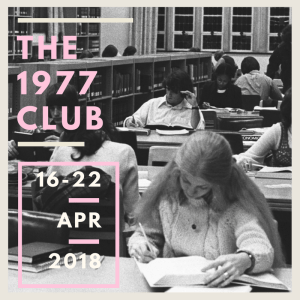 Just incidentally, I found it fit into the 1977 Club. Coming into the Country is about Alaska, as it was in the mid-1970’s. The book is divided into three parts, focusing on different visits he made there. “The Encircled River” describes a trip he took within the Arctic Circle with a group of scientists. 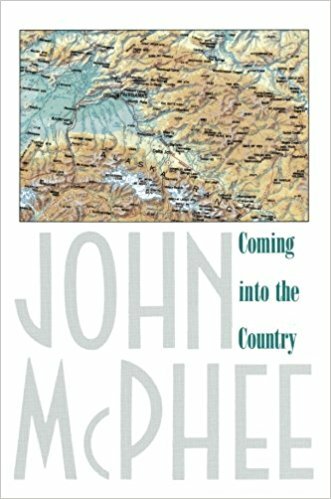 In “What They Were Hunting For,” McPhee travels around with a state-appointed committee that has been tasked with finding a new location for the state capital and explains the political situation in Alaska at the time. It was ironic to reflect that the capital never moved. “Coming into the Country,” the longest section, is about the life, people, and politics along the Yukon River, still at the time one of the most rugged areas of the state. These reports all feature McPhee’s trademark details of person and place that make his writing so interesting. I was also pleased, in googling some information, to discover the Yukon-Charley Rivers National Preserve website, which had photographs of some of the people and places McPhee talks about. I found Annals of the Former World, which explored the geological formation of different parts of the United States, to be profound. Oddly, the subject of Coming into the Country seems more removed, yet McPhee makes it compelling reading. Mary Stewart’s My Brother Michael is the first place I heard of Robert Louis Stevenson’s Travels with a Donkey. It is a short travelogue of a journey Stevenson took in 1878 in the remote Cévennes area of southern France with only a donkey for company. This book is full of descriptions of the people and scenery and relates with some humor the author’s struggles with Modestine, the donkey. It also tells some of the legends and history of the area, which was the site of a religious revolt by the Camisards, a sect of the Huguenots, in the 17th century. Although this history is interesting, for my tastes Stevenson spent too much time discussing religion, particularly as he asserts at one point in the book that he does not believe in God. Yet, he makes comments that sound like he does believe. He has several discussions about religion with people he meets on the trip, and he muses on the subject. It seems natural to compare this work with that of Patrick Leigh Fermor, particularly the trip he made as a youngster through Europe. But Fermor’s work is at once more sparkling, witty, and erudite, although the type of content is the same. I felt that this book was only of moderate interest. Letters from Egypt is the book I drew for the latest Classics Club spin! A book like this one is hard for me to evaluate. Lucie Duff Gordon was an English gentlewoman suffering from consumption who spent the last seven years of her life in Egypt, hoping the climate would help her. The book of her letters is heralded as a first to deal with the Egyptian people rather than the scenery and monuments. She was by all accounts beloved by the people she lived among in Luxor from 1862 to 1869. I try to judge books as best I can by the standards of their own time, but sometimes with this book that was a struggle for me. Duff Gordon is known for being kind to the people she met, particularly the Arab fellaheen, who by all accounts were the despised of Egypt. Certainly, she was loved by them and is careful to follow their customs, but she does patronize them in just about every word of her letters. She also takes pleasure in telling stories about how much they love her and what courtesies they exchanged. She adopts their customs and learns to speak Arabic, all very laudable. However, it seems to me that she takes their part to the point of perversity, for example, sprinkling Arabic words into her letters to friends and so participating in their customs that she speaks casually of such things as buying slaves (for herself), always for their own good, thirty years after England outlawed slavery. Further, she favors the Arabs by putting down other groups, like the Copts, the Jews (even though she meets hardly any), and some of the Turks but not all, even though the Turks would seem to be to blame for the dire state of the country. If you are feeling politically correct, you may not appreciate her frequent use of the N word, and her constant mention of the color of the various people she meets, although that is clearly a difference in the standards of the time. The book does have descriptions of various ceremonies and customs, which are interesting. And Duff Gordon’s behavior toward the people was clearly better than that of most “Franks.” Another slight issue is that she tends to use Arabic and Egyptian words without always explaining what they mean, which can be confusing. I want to compare this book to West with the Night, which was written 90 years later. Beryl Markham was raised with Masai playmates in what was British East Africa. Never does she treat her native friends condescendingly. Not only that, but her book provides a better sense of the landscape and society of Africa, although admittedly more oriented toward the European. Another contrast is Tales from the Queen of the Desert, in which Gertrude Bell ventures into even more remote corners of the Arab world while not once patronizing anyone. I will frankly admit here that I am a massive Dorothy Dunnett fan, and as such, I am eager to read anything she wrote. In this case, it’s an homage to the Scottish Highlands that she wrote with her husband Alastair, illustrated by photographer David Paterson. Alastair Dunnett was a journalist, novelist, and man of many talents. Dorothy Dunnett was an internationally known historical novelist and portrait painter. This book is beautifully written and has gorgeous photographs. It is oddly organized for this type of work, though. The photographs and the text are presented independently, even though some overlap occurs. First, there is a section of text by Dorothy Dunnett, divided into areas of the Highlands. After that, the rest of the book is divided into the same areas, with Alastair’s text followed by Paterson’s photos. No attempt has been made to integrate the two Dunnetts’ text with each other, and little attempt has been made to integrate Alastair’s text with the photos. A contrast to this book’s approach is James Herriot’s Yorkshire, where Herriot’s text and photos about the same places appear together. It’s almost as if the editors of The Scottish Highlands were putting together three different books. Still, it does make me want to visit the Highlands. Of course, I already wanted to. The Road to Little Dribbling is only the third book I’ve read by Bill Bryson, but it is the one I’ve most enjoyed. 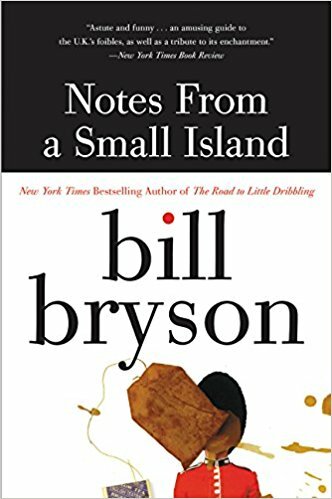 It is a follow-up to one of Bryson’s most popular books, Notes from a Small Island (which I have intended to read but have not), upon its 20-year anniversary. Both are about travels in Britain. In The Road to Little Dribbling, Bryson draws an imaginary line between the two farthest points on mainland Britain and takes expeditions to some of the places on either side of the line. His line begins in a minor southern seaside town named Bognor Regis (where, oddly, I began my first visit to that country) and ends in northern Scotland at Cape Wrath. The things that make Bryson’s books stand out are that he has many humorous observations to make and he is endlessly curious about everything. So, he has lots of stories to tell about the places he passes through, some of them personal, some historic, some scientific. He is also skillfully descriptive of beautiful scenery. A recurring theme in the book is the impact of austerity measures on national landmarks and scenery. Also related to the economy is the growing dereliction of some of the towns he passes through. But he makes it clear that there is still much of charm and beauty to be seen and that many places are thriving. I always enjoy Bryson’s comments about the lack of basic knowledge among some of the general public, because I have observed indications of that with dismay. I just recently viewed a video of Texas college students who were unable to answer basic history and political questions such as “Who won the Civil War?” or “Who did we get our freedom from?” but could answer every question about celebrities. I suppose this should not be surprising, since for the past couple of years my husband and I have observed that watching “NBC Nightly News” is now more like watching “Entertainment Tonight” than actually watching news.